At the time when the story of the New Testament begins, the land of Israel, called also the land of Judea, was ruled by a king named Herod. He was the first of several Herods, who at different times ruled either the whole of the land, or parts of it. But Herod was not the highest ruler. Many years before this time, the Romans, who came from the city of Rome in Italy, had won all the lands around the Great Sea, the sea which we call the Mediterranean; and above king Herod of Judea was the great king of Rome, ruling over all the lands, and over the land of Judea among them. So Herod, though king of Judea, obeyed his overlord, the emperor at Rome. At the time when this story begins, the emperor at Rome was named Augustus Cæsar. At this time, the land where the Jews lived was full of people. Jerusalem was its largest city, and in Jerusalem was standing the Temple of the Lord, which king Herod had lately built anew, taking the place of the old Temple built very many years before, which had long needed repair. There were also many other large cities besides Jerusalem. In the south was Hebron among the mountains; on the shore of the Great Sea were Gaza, and Joppa, and Cæsarea; in the middle of the land were Shechem and Samaria; and in the north were Nazareth, and Cana; down by the shore of the Sea of Galilee were Tiberias, and Capernaum, and Bethsaida. Far up in the north, at the foot of snowy Mount Hermon, was another Cæsarea; but so that it might not be confused with Cæsarea upon the seacoast this city was called Cæsarea-Philippi, or “Philip’s Cæsarea,” from the name of one of Herod’s sons. One day, an old priest named Zacharias was lead ing the service of worship in the Temple. 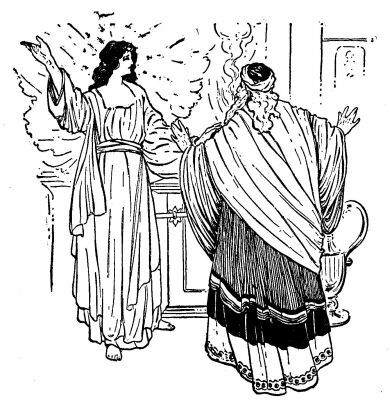 He was standing in front of the golden altar of incense, in the Holy Place, and was holding in his hand a censer, or cup, full of burning coals and incense; while all the people were worshipping in the court of the Temple, outside the court of the Priests, where the great altar of burnt-offering stood.